It was with great trepidation that I visited Sprite’s Site. Last year Sprite set up an elaborate April Fools Day trick. She claimed that she could escape from her blog world and return to it and that other people would be able to get into her blog world by the same entrance. I had been reading about all the brilliant April Fools Day tricks played by Google at http://en.wikipedia.org/wiki/Google’s_hoaxes and trying to devise a trick to play on Sprite. And I wondered whether she would try to better last year’s effort. 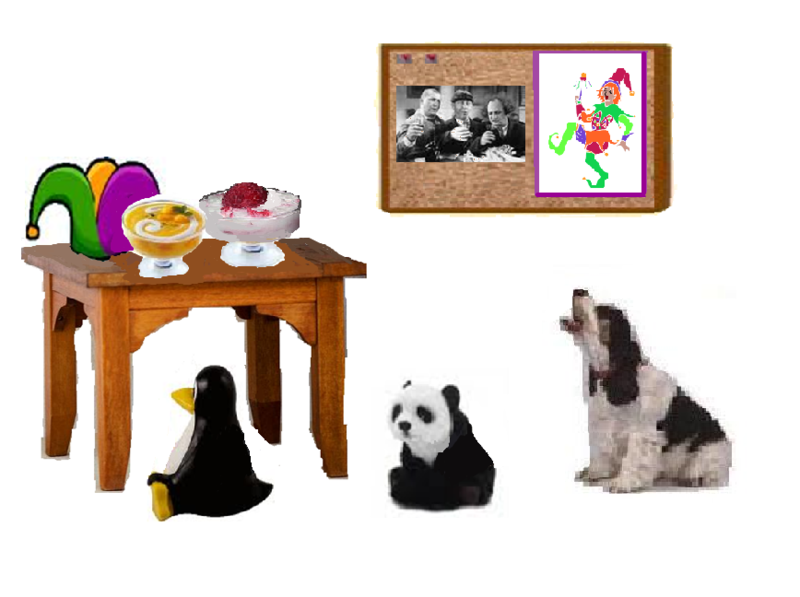 This year, however, all I found was the table set with mango fool and raspberry fool for the #gtstoogies supper, Sprite’s soft toys, Penguin and Panda, and Emotional Dabrowski. 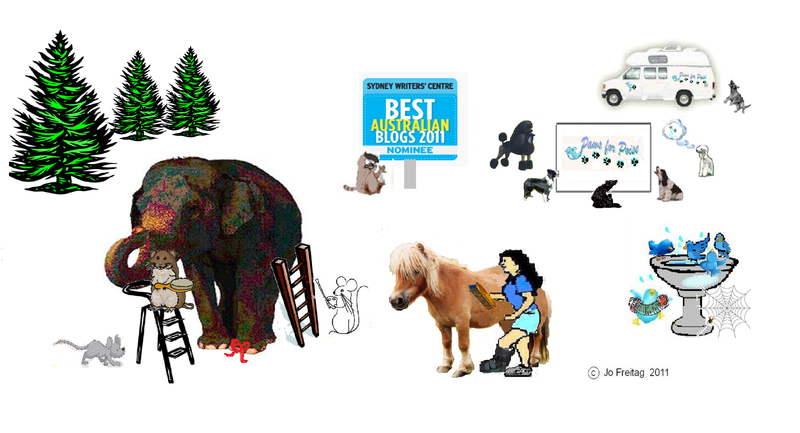 As Sprite’s Site is a nominated blog for Sydney Writers’ Centre Best Australian Blogs 2011, I told Sprite that we needed to spruce up the blog so that it will be ready for the judges and the people who want to vote in the Peoples Choice section to view. I suggested that she should start with her room or maybe follow the guidelines in the Clean Up Australia Day booklet; but she thought we should just add some Spruce trees to the site and get all the characters to take a bath! She said her contribution would be to groom Ginger Pony. She arranged for the Paws for Poise Mobile Cyber Dog Grooming Parlour bus to come; so that the Dabrowski dogs could be spruced up. P’est Pour Parfait, the perfectionist poodle, arrived with the van. Apparently he has become the PR rep for Paws for Poise. The Twitter birds enjoyed splashing in the bird bath while Arachnid set about repairing broken links on the website and talked earnestly about tags and widgets and other improvements that could be added. Sprite organized the mice, Oliver MoreMouse and Hieronymouse Bosh, to scrub and repaint The Memory Elephant. I told her that she should be the one responsible for the maintenance of her Memory Elephant! Sprite and I would love it if you could visit these posts and maybe even leave a comment. The #gtstoogies are celebrating the changing of the seasons this week with a BBQ just as they did in September last year. The Topiary Tessellation Bird Leaf Tree for all seasons has been brought out again and Jen E Wren is discussing the opening of Australian Rules Football season with Magpie. Native American Indian Dog is paying a return visit to his good friend Intellectual Dabrowski. 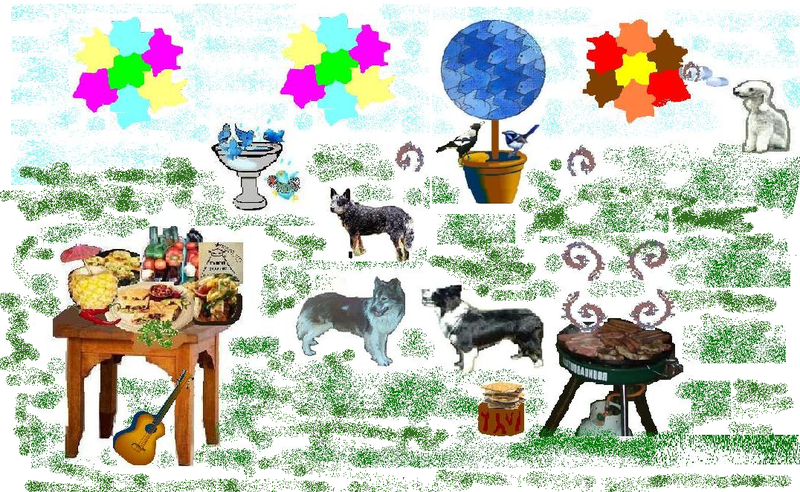 Australian Cattle Dog is again drawn by the wonderful aromas wafting from the BBQ and Imaginational Dabrowski is thinking about how the Australians are having Autumn leaves at the same time as the Americans are having Spring blossoms and new leaves and how good BBQ food tastes in either season. There is no explanation for the appearance of the extra spring thoughts; except that Imaginational Dabrowski loves the promise and rebirth of Spring and that it helped to balance the picture when it was reversed, because the table refused to be moved to the other side of the picture! Having created mindmaps in iMindMap and Spicynodes and drawn up a Venn diagram with the results for addressing the problem ‘How to improve SerendipEd and attract more attendees’ I have now drawn up another mindmap using iMindMap to chart possible methods of promotion for SerendipEd webinars. Serendipity and Fine Focus webinars are ideal opportunities for educators to share their knowledge and experience the sort of informal professional development that happens when people get together and network. Those who would benefit most from attending are teachers from every education level and all curriculum areas, student teachers and those seeking additional PD. The places that they would be made aware of the existence of the excellent webinars are via Twitter, blogs and websites, webinars, lists of resources and personal recommendations. There seem to be formal and informal options for promotion of the webinars, InReal Life and virtual methods of promotion and real and virtual incentives. As you can see there are several unlabelled branches on the map. These have been left without labels so that additional ideas can be added. What other suggestions could be added? On Saturday 26 March at 8.00pm UK time Tim Dracup (or Gifted Phoenix as we know him on Twitter) will be leading a workshop in Second Life titled ‘A Global Perspective on Gifted Education’. The picture above is the avatar designed for him for the occasion by Roya Klingner. The Workshop is his personal contribution to the inaugural celebration of the European Day of Talent, celebrated on 9 April 2011, which has been organised by the Hungarians as part of their drive to support European gifted education while they hold the EU Presidency. You can find further details and about how to join the event on the website of the Bavarian Centre for Gifted and Talented Children which has been organising a series of Global Gifted Education meetings in Second Life, this being the sixth in the series. Tim intends to take a slightly different direction to his predecessors in the series by making a serious effort to maximise interaction with the participants. 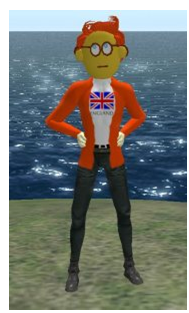 It should be a very interesting and thought provoking Second Life session. After considering the two mind maps I made on the topic Attracting More Participants to SerendipEd I came to the conclusion that the SerendipEd webinars are well named. Jo Hart has often said that attendence numbers vary with the time of year (class times, holidays, daylight savings time etc). By making a Venn diagram based on the mind map which was made with iMindMap we can see that the participants come from the fortunate group who have reason, incentive and most importantly available time to attend. So to answer the question ‘What can be done to attract more participants to SerendipEd webinars?’ we need to look at what can be done to enlarge the areas of overlap especially the vital centre section of full congruence which I have shaded in violet because that felt like a serendipitous sort of colour! 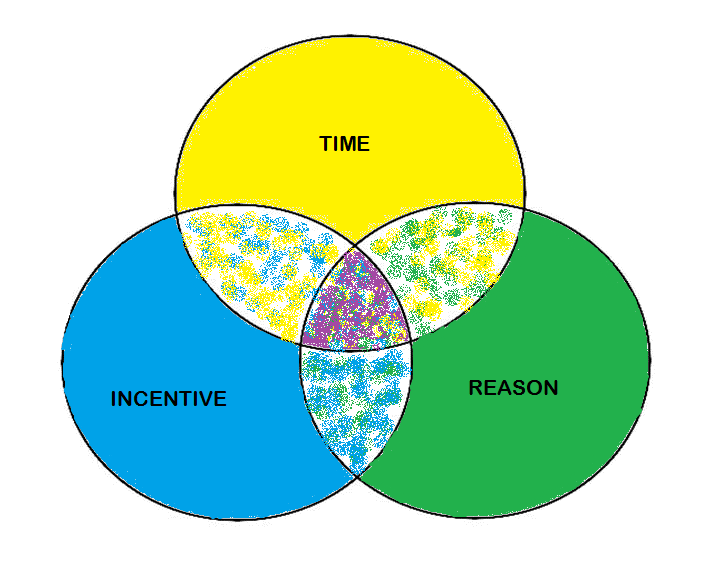 Most of the Incentives listed on the iMindMap are intrinsic motivators. Are some concrete external motivators needed to attract participants? Would making the webinars constitute part of training courses be an option? This would lead to a whole extra set of questions in regard to certification and funding sources and time required and whether, if the webinars were completely formalised, they would still retain their Serendipitous nature. Another aspect of Attracting More Participants is spreading the word or advertising and that is another whole topic of discussion.